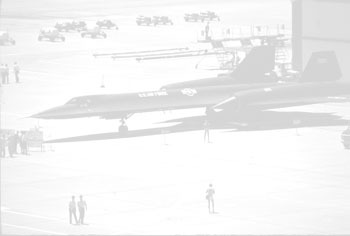 Still not satisfied, the 4-cross emblem of the 9th Strategic Reconnaisance Wing was applied to the top of both rudders. Also, someone realized that the tail number was still not up to new Air Force standards - under the current scheme, 17-971 would refer to an airplane ordered in 1917. Nowadays the Cold War is over and planes are a lot more expensive than they used to be, and we don't buy as many as we once did. As a result, 5-digit serial numbers (2-digit fiscal year + 3-digit sequence number) have been standard for a while. Air Force regs now call for the fiscal year in small numbers, followed by the sequence number in larger numbers. 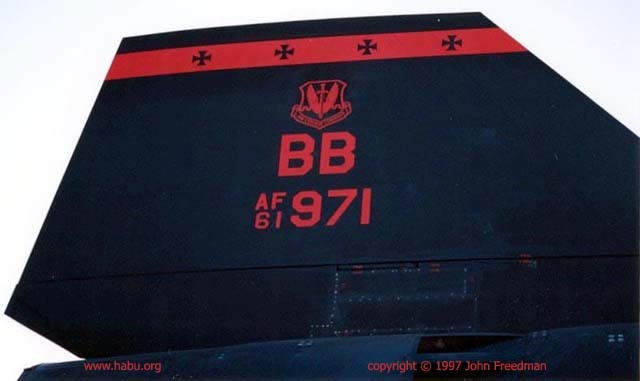 The 7 got dropped, and the Beale Bandits were repainted as AF61-967 and AF61-971. In November 2002, her outer wings and engine nacelles were removed by volunteers from the Evergreen Aviation Museum and taken to their new home in Oregon. The rest of the airframe is due to be delivered to the museum in early May 2003.